This is the detective series that inspired them all. Legendary actor Peter Falk is back in his 4-time Emmy Award winning role, as the ruffled, cigar-chomping, trenchcoat-wearing police lieutenant who is asking all the right questions in seasons 1-8 of Columbo. 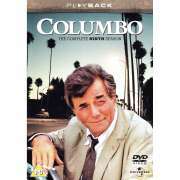 This 25 disc box set features all 47 episodes from season 1 to season 8 and includes 2 bonus episodes with Mrs. Columbo and the 2 series pilots.